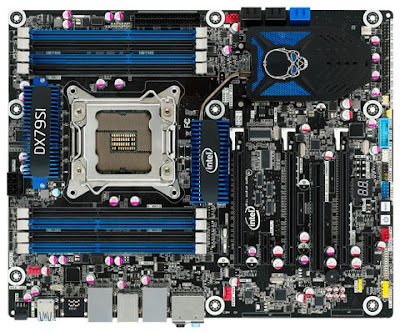 If you have an Intel DX79SI "Siler" motherboard then you are lucky by a fast and costless upgrade of the PCI Express standard up to version 3.0 just by flashing the motherboard BIOS with a new revision already available. The BIOS update Version 0424(SIX7910J.86A.0424.2012.0127.1620) does come with over 20 fixes and performance enhancements, with this update you can prepare your DX79SI "Siler" motherboard for the next Nvidia GTX 600 series which support the PCI Express 3.0 standard with approximately the double bandwidth speed or if you already have an AMD Radeon HD 7900 series graphic card go and update the BIOS now. To download the PCI Express 3.0 BIOS update open this page (please make sure of the same motherboard model name).